Next on The Scoop: Ask a Vet: Why Do Some Vets Back Vaccinating Indoor Cats? 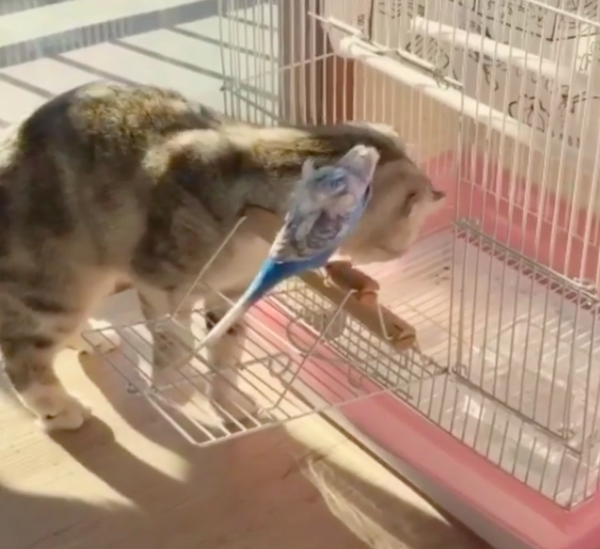 The relationship between cats and birds is a curious thing. 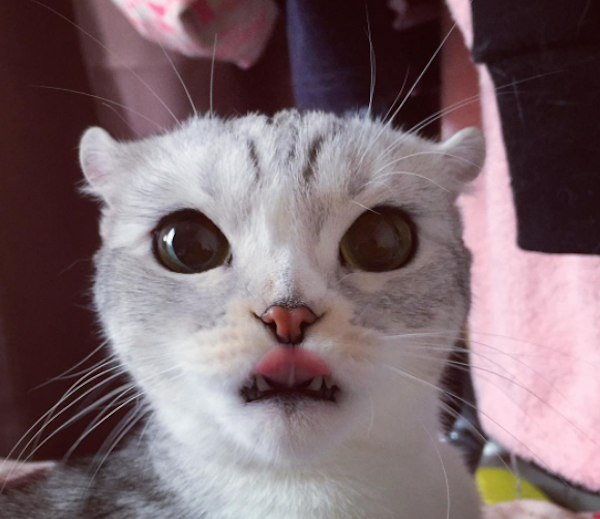 Pop culture outlets on TV and in comic books and cartoons tell us that cats are born with an innate desire to stalk, hunt down and terrorize these winged creatures. But if you take a trip through the land of Instagram, you’ll very quickly come across photographic evidence of cats and birds living not just in harmony but forming friendships. 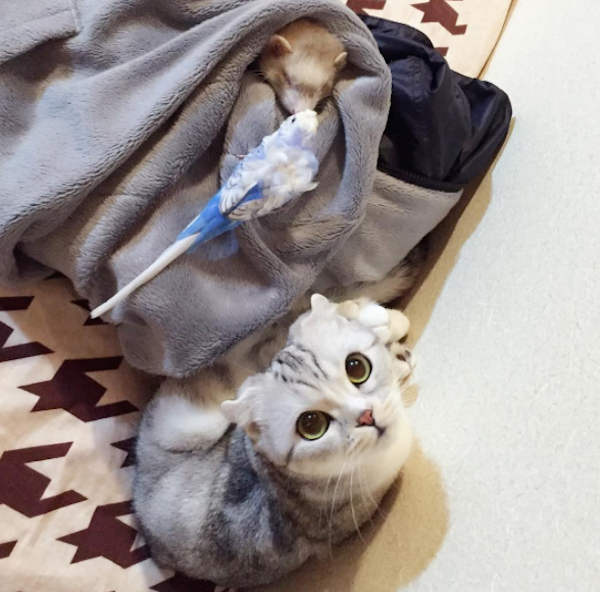 Hana, a kitty out in Japan, and Sai, a budgerigar, are proof of this. Let’s dip into their relationship. First up, let’s talk about Hana. 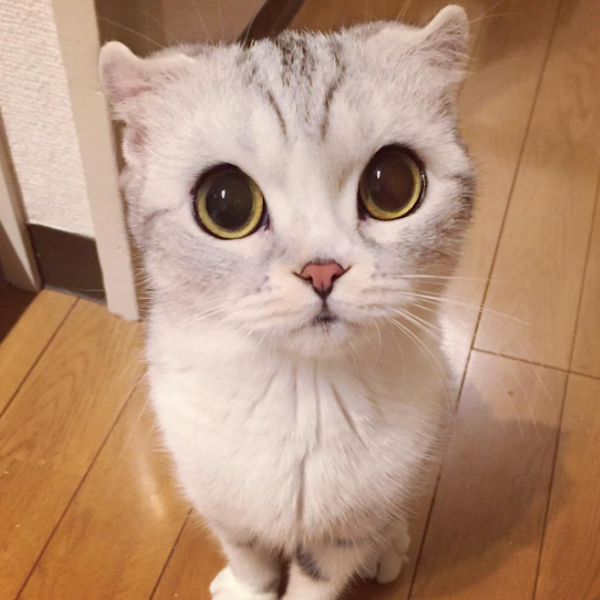 She’s a Scottish Fold who’s three years old. 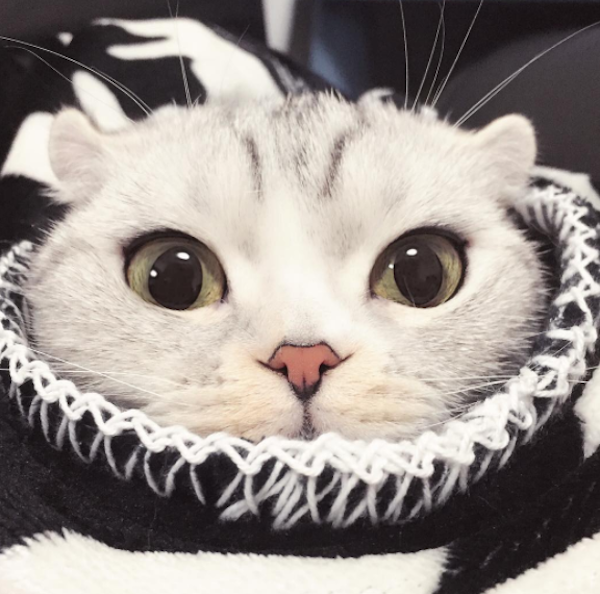 With her white fur, subtle gray markings and brilliant bugged-out eyes, she has captivated social media followers and racked up an impressive quarter of a million fans. Not bad going for a humble cat. While Hana is not a full-fledged alien cat like the world famous Matilda, her owner does like to play up her otherworldly oculars. Usually that involves posting the alien emoji after pictures of her, like this one here — although the extra teeth action seems to cast Hana as an unfriendly extraterrestrial being. 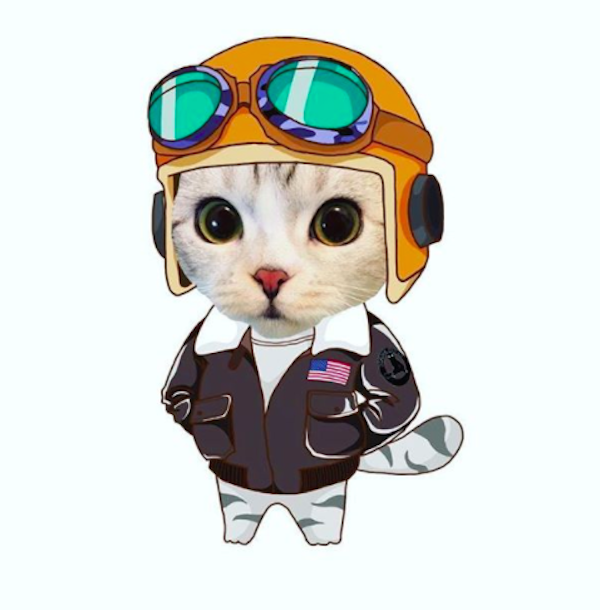 Speaking of emojis and whatnot, Hana recently experimented with turning herself into a U.S. Air Force pilot, a fire-breathing dragon and a feline rocket ship thanks to the wonders of the Internet. 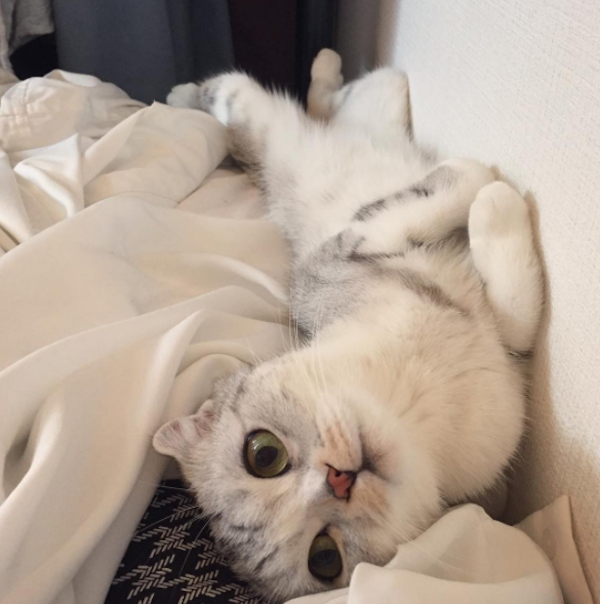 When it comes to day-to-day life, Hana enjoys partaking in the usual cat pursuits of exploring, napping, and lounging about. Here she is captured dealing with the rigors of a “boring afternoon” by stretching out, relaxing and contemplating the big issues facing the world in these tumultuous times. Oh, and sometimes this lounge lifestyle involves smooshing oneself into cosy knitted clothes. 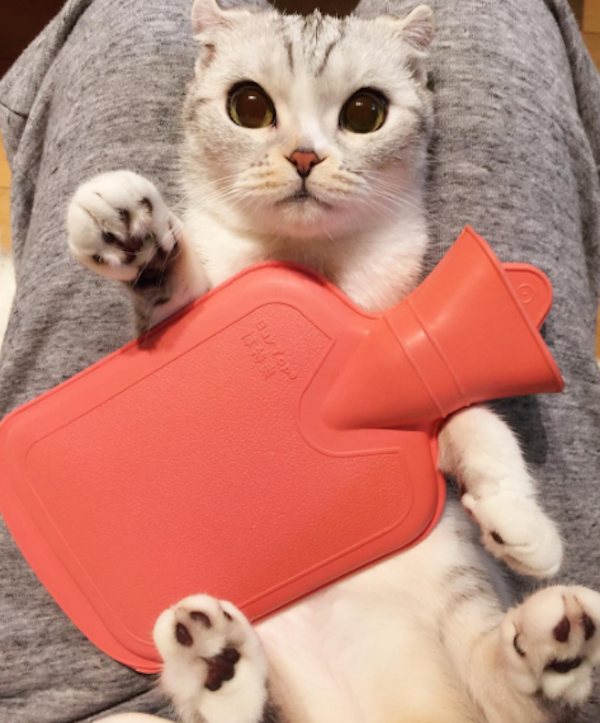 Hana’s also not averse to some toasty hot water bottle action. In fact, being all warmed up seems to tease out the philosopher in her. As she posited in the caption to this photo: “Friends, happy is the winter in not only the warmth of our hands, and the warmth of our hearts, [but] the warmth of our life.” A sideline as a Hallmark greetings card writer beckons. Remember Sai, the domesticated bird I was telling you about? 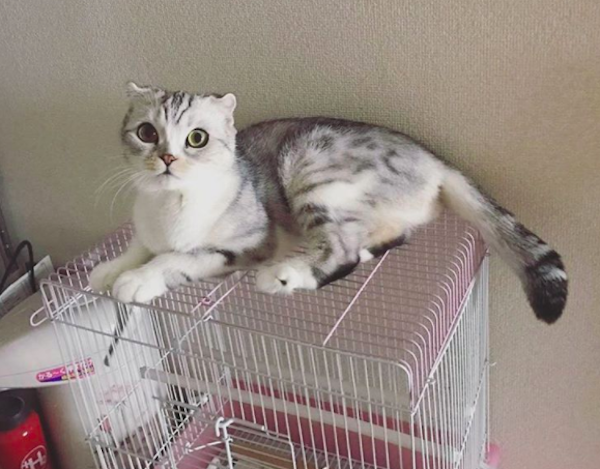 Well, here’s Hana dutifully sitting on his cage. And here they are hanging out together. Notice how Hana has precisely zero interest in sinking her chops into Sai’s no doubt succulent feathered flesh. Does a caged cat sing? 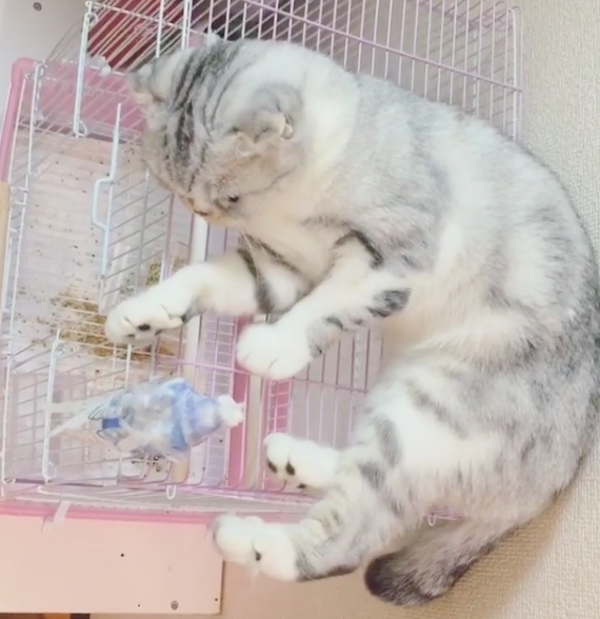 Apparently Hana has her eyes on getting into the bird cage. No idea what’s going on here, but my instincts want to suggest that somehow a ferret managed to wrangle its way into Hana and Sai’s world. 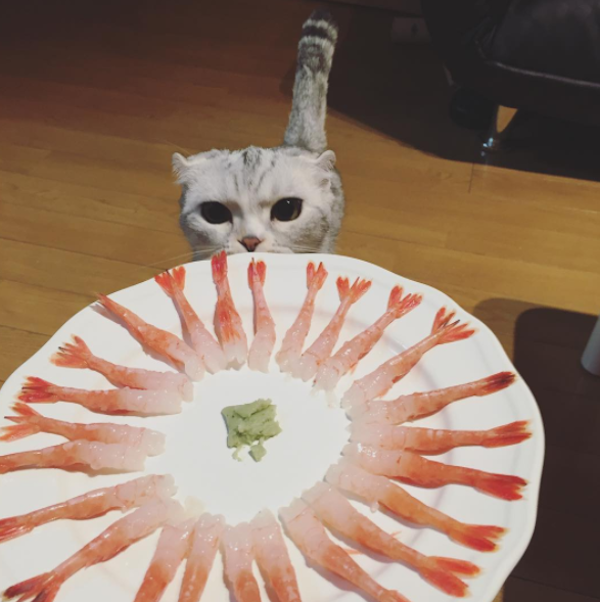 Finally, always remember that happiness is a full plate of shrimp. Follow along with Hana’s antics over at Instagram.